Started over 50 years back, Fiat 500 has evolved itself commendably with new designs and power engines. 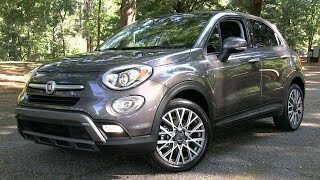 Changes became more gainer since 2007, when series started competing with Volkswagen and MINI models and now here we are in the year 2015 and an all new model Fiat 500X 2015, looks like set to compete with Jeep Renegade 2015 and MINI Countryman. Well the list of competitors never convinces wholly till you have a descriptive glimpse of the model. So let us not delay and a have a sneak inside. Interior of Fiat 500X 2015 is quite distinct when compared to a regular 500 holds new features and design. Major sight of attraction in the entire interior is the dashboard featuring 5” or 6.5” Uconnect infotainment system with Bluetooth and USB connectivity. Controls of the same are also mounted over steering wheel giving the driver a concentrated ride. While the former comes with a TomTom 2.5D navigation system, Latter with it attaches satellite navigation with 3D maps and ‘One Shot Voice Destination Entry”. 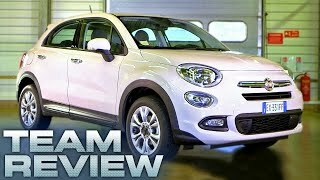 With these features Fiat 500X 2015 undoubtedly rises a little above in its compact crossover segment. 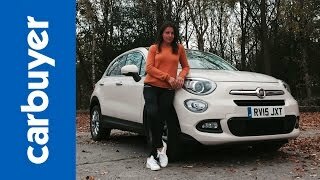 Unlike the interior, exterior of Fiat 500X 2015 holds similarities with the predecessor 500 but to be mentioned, with its little oversized elements and sporty looks, it has got its name embarked in the segment of sporty crossovers. Fiat 500X comes with more muscular body and thus takes a lap ahead of its siblings. Headlamps get a larger size making their way to the fenders and hood, a larger grille holding beneath a buffed bumper together makes the front fascia more aggressive and sporty. While the higher ground clearance prepares it ready for all terrains the wheel arches, side skirts and raked rear glass add to the glory of this muscular cross over through the plastic cladding covering provided on them. 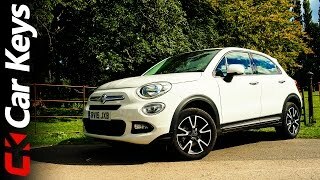 In the entire Fiat 500X 2015 has a sporty exterior over a muscular body. 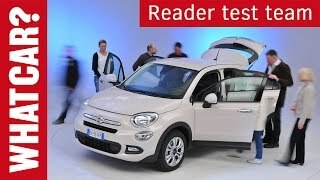 Fiat 500X 2015 offers its customers a total of seven powertrains including four gasoline and three diesel. Gasoline includes 1.6 Liter E-torQ delivering 110 hp till the most powerful in list 2.4 Liter Tigershark delivering 184 hp. In the diesel engines segment range begins with basic models being offered a 1.3 Liter delivering 95 hp and lasts till top notch in list, a 2.0 Liter delivering 140 hp. Speaking about transmission, gasoline range is paired to either a 5/6 speed manual or a six speed automatic for the FWD models. They do have an AWD with 1.4 Liter Tigershark that delivers 170 hp and the engine is mated to a nine-speed automatic transmission.